I've been looking at Mathieu Harlaut's photos of a beautiful 15th c. longsword in the collection of the French National Medieval Museum ( http://www.myArmoury.com/talk/viewtopic.php?t...ight=cluny ). I've searched this site and haven't found much information about the historically correct way(s) to make a rainguard. Can anybody tell me more about that? The photos below are pretty clear, but Mathieu mentioned that this example has been cut and repaired. I'm not sure what that means. Looks to me like everything at the level of the cross and above is original, but for some reason the lower lobes of the rainguard were either cut off along their tops, then reattached, or the lowest parts of the lower lobes were damaged and replaced by stitching them onto the remains of the original lower lobes. Not clear why one wouldn't just replace the entire lower lobes by removing all of the originals and using the original stitching holes. I assume these are working-life repairs. Is the form and construction historically correct? 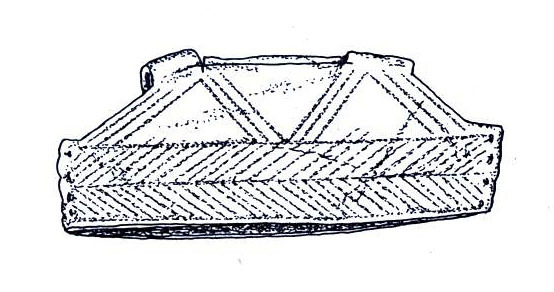 Another thing was a crust or flake with a different structure that was adhering to the middle of the cross guard. 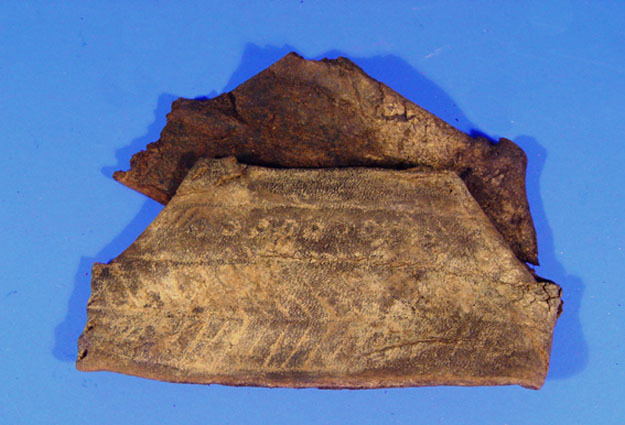 It had the same structure as the leather of the grip and on closer examination it turned out to be leather of a thicker kind. This was proof there had once been a rainguard on the sword. One should not be surpriced by this as it was a very common feature on swords at this time. In fact, many of those swords we love and know well that have just a plain cross today, once had rainguars as well. It is just that these tend to be worn away by time as the leather becomes fragile as it dries out. As to the shape of the rainguard we could only guess. There are two general types to choose from: a tubular type that encloses the blade on all sides (this is the type on the elegant "Bayerisches sword") or the rainguard can be two tounges or flaps on each face of the blade. I tried both types and decided for the latter for my initial reconstruction. I am not fully decided yet, though. The rainguard could have been a tubular one. We have chosen to make the Albion reconstruction not straying too far away from my initial interpreatation in these details. Most who like the sword knows it from the reconstructon with the red-brown leather and slightly leaf shaped rain guard. The exact shape of that rainguard is taken from some swords depicted in art in the church where the sword was found. We (Patrick and I) wanted some connection to the origin even as we could choose freely on different soultions. 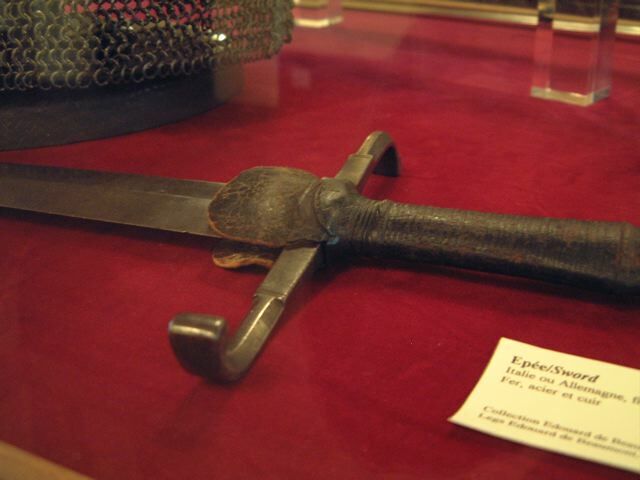 The other possibility is that the rainguard did look pretty much like the one on the Bayerisches sword. I think that answers my questions. The color on this picture should clarify what I meant. The original grip is in green, the original flap is in pink and the reparation in blue. 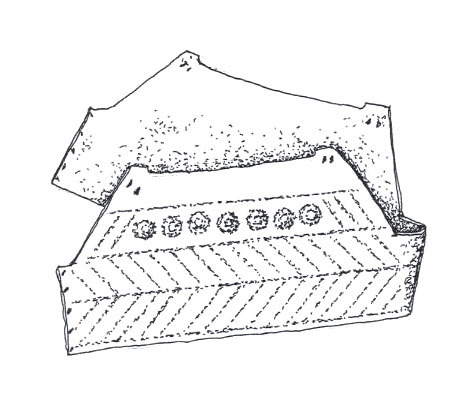 There is a stitch along the bottom curved edge of the grip (tip down) connecting the leather of the grip with the orignal leather flap. The original leather flap is cut along the bottom edge of the cross which seems logical. BTW, rainguard is perhaps not the purpose of those flaps. Some swords have some and other don't, there is no reason why some people would allow rain to enter the scabbard and other won't. 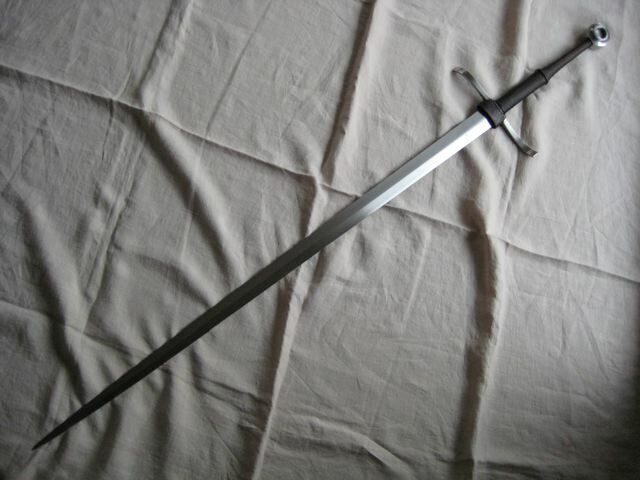 It is usually seen on german longswords and very often on hunting sword, usually on straight crosses that would not allow the water to get in the scabbard anyway. 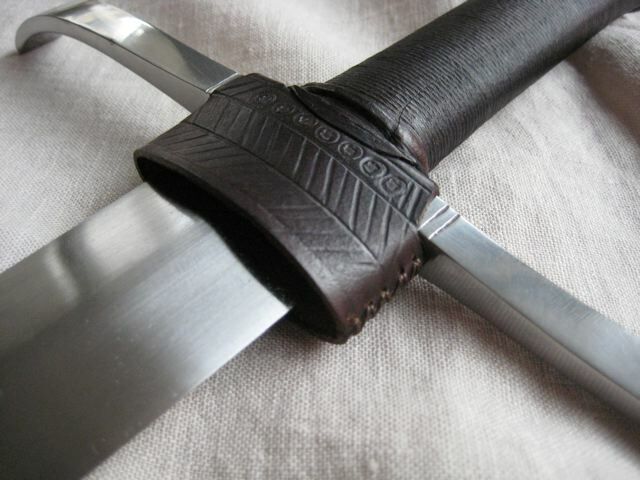 Both in hunting and german longsword fencing you may have to put your fingers and thumb on the blade, perhaps that is the real purpose of the so-called "rainguard". I have made a cylindrical leather flap for my Albion Munich. Perhaps you would like to see some pictures of it. Unfortunately, I made it after the grip was done (obviously) and I couldn't stitch it on the edge of the grip. I only used glue which seems to work quite well. Wow. It seems that this thread, which I was most interested in, has been quickly revived after Sean seemingly ended it promptly, much to my disappointment. I was looking forward to a long and vigorous discussion on the topic. I guess this casts doubts on both the shape of the original "rainguard" and it's purpose. Having said that, I'm still not convinced that a straight guard would prevent rain from entering the scabbard, nor would I imagine that this leather flap would be more effective or practical a protection from cutting your own fingers than a simple ricasso. I'm keen to hear other people's opinions on this topic. Thanks Sean. 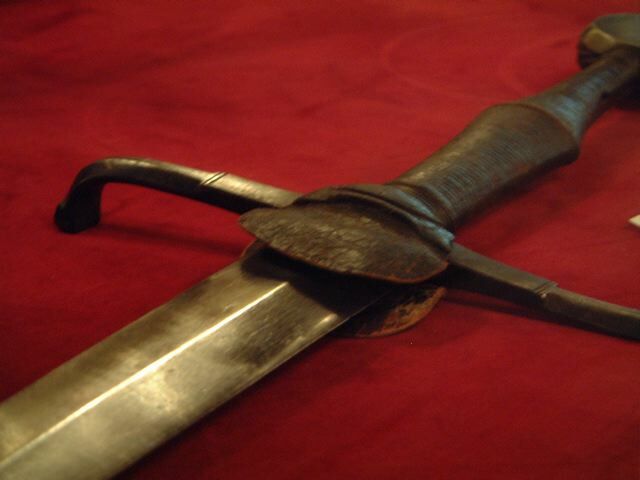 It is difficult to imagine water going into the scabbard even without a leather flap. A scabbard should be quite tight to serve its purpose and the probability that rain will drip inside is very low. I have carried swords under pouring rain and water never went inside. You usually find leather flaps on many (if not all) cross like the one in Cluny museum or Munich whereas the straight cross would give a closer fit between the scabbard and the cross compared to a cross with a point toward the blade. I would imagine the sword of Henry V and many of the swords found in the Dordogne near Castillon, would allow more water to get in. You don't usually find leather flaps on those sword. I know it is not conclusive point but it shows that rain wasn't such a problem since many sword don't have any leather flaps but nearly all those swords were carried under the rain. 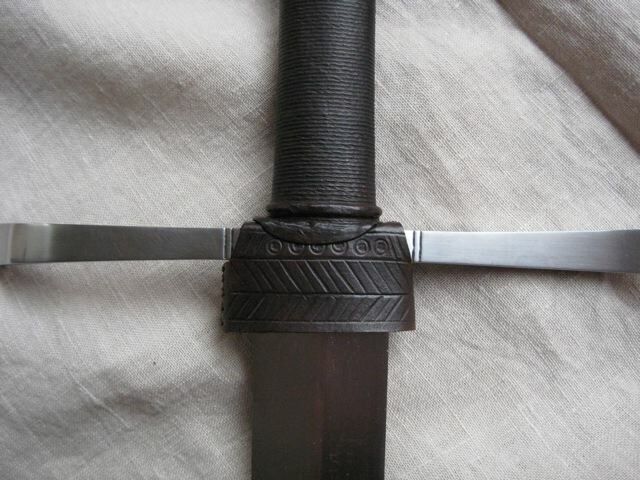 Leather flaps are seen on certain types of sword and not on other. 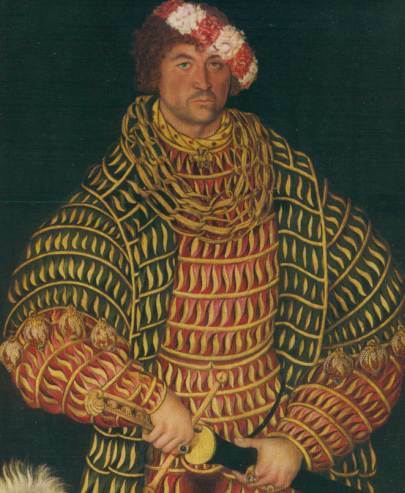 It seems that tradition, fashion and fencing techniques have an influence on that. 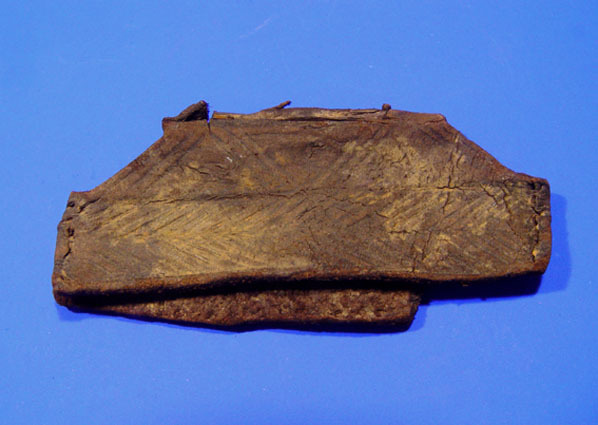 In the "thumb on the blade" theory, the leather flap is not meant to prevent to cut fingers, but it would be less slippery and more comfortable than bear metal. Anyway the blade are not usually sharpened all the way down the cross even without ricasso. 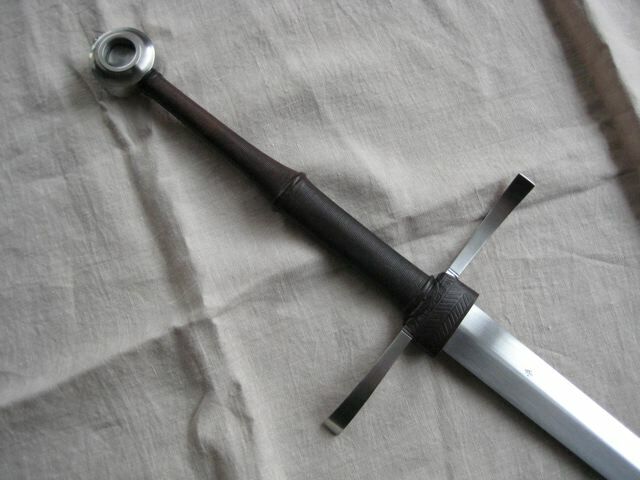 In the XIVth and XVth century hunting swords in Arts are usually shown with leather flaps. In the end of the XVth century and XVI th century you find some with a metal cylinder being part of the cross and covering the base of the blade. On other forums and discussions, people suggested the blood issue. I don't know what was the real purpose of those flap but I must admit that the rainguard theory is not the most convincing. I have no idea what the purpose of the so-called rain guard is. But to say that swords with ecussons don't fit their scabbards as well as swords with straight guards is not very logical to me. Swords with ecussons (points on the guard) wont' fit a scabbard less tightly than a straight guard if the scabbard is made properly. 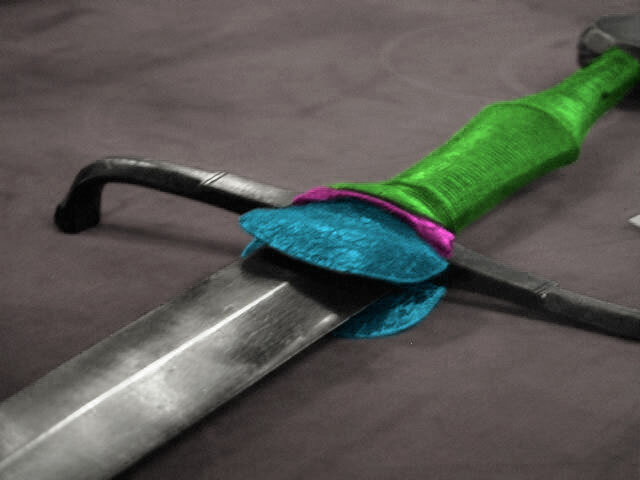 A good scabbard's top is shaped to exactly fit the underside of the guard, regardless of the guard's shape. Why did swords with ecussons seemingly not have "rain guards"? Perhaps because the ecusson is a decorative feature and a rain guard would cover it up. I believe my explanation are not really clear. I am not saying that the scabbard will not fit as good. The shape of the "entrance" of the scabbard and the shape of the cross would just make it easier for the water to get in. It is a question of angle and such, quite difficult for me to explain in english. A straight guard would act as a real stopper whereas a cross like the one of the Albion Castellan would "lead" the water dripping into the scabbard more easily. Exactly, you are right. It is an other way to explain my point : if rain was such an issue, they wouldn't choose a decorative feature over something useful. Like you I don't have the true explanation, I am not more convince about one explanation than an other, but no one is really sure about the use of those flaps and they are a couple of discussions on their use in many forums. I am only stating that simply calling it "rainguard" is a bit reductive, and implies a use that is far from being certain. Thanks for the color clarification! I thought that was what I was seeing, but I'm glad to have confirmation. Here's another question. Could you tell if the original "lobes" of this guard were separate (two pieces) or one piece simply folded over the cross before the grip was installed? In other words, looking at the cross from the side, would the original guard look more like this...? And, yes, I know we'd all love to see the guard you made for your Munich! Wow. It seems that this thread, which I was most interested in, has been quickly revived after Sean seemingly ended it promptly, much to my disappointment. I was going to keep it going, no matter what! If nothing else, I was going to post all the examples I could find. As for what this tells us about the shape of the original guards--Since there wouldn't be much reason to restore guards to a relic, I suspect that this could be a working life repair. If so, that's about as good as the original for my purposes. Moreover, the shape seems to be consistent with guards depicted in contemporary artwork. I'll dig up some of that art and post it here. I am not really sure about the one in Cluny. I could take a look the next time I go there but I don't know when it will be. Here are some originals that could help you. They were found in Dordrecht. I took inspiration on one of these for my Munich since it is less decorated than the original sword in Munich I thought it was consistent. The images have been found somewhere on the following site but I cannot find it anymore. Those images are extremely helpful, Mathieu! Thanks! I promised some pictures of the leather flap I made for my Albion Munich. I had to unglue the leather at the bottom of the grip. It was a bit tricky, but with water and patience, it worked quite well. It is inspired by one of the original from Dordrecht. I've been watching this thread, marvellous! I had to speak out! And Mathieu Harlaut that works really well, congratulations. Excellent looking rainguard there! Very inspirational. Thanks for your comments. I believe that this type of sword cannot go without. When I bought the sword it was clear for me that I would try to make one. No it is complete in my eyes ! Sean, the selection you made is wonderful. So very interesting examples. So far I'm seeing only these D-shape and tubular examples--nothing like the clamshell shape of the example from the National Medieval Museum. The tubular type seems to be most common in the artwork I'm looking at. Pretty much every German/Austrian longsword image from this period is showing a guard, even those used by executioners. Other folks looking for examples in late 15th c. painting should note that almost all of the images I'm finding of St. Catherine show her holding a longsword with a leather guard. Search for "Hl. Katharina" at the site I mentioned above.